When you invest in mortgage-backed securities (MBS) you are purchasing an interest in pools of loans or other financial assets. As the underlying loans are paid off by the borrowers, the investors in these securities receive payments of interest and principal over time. Agency securities are issued by a government agency such as Ginnie Mae or a government-sponsored enterprise such as Fannie Mae or Freddie Mac. The mortgage-backed securities market also includes “private-label” mortgage securities issued by such as subsidiaries of investment banks, financial institutions, and real estate investment trusts – issue MBS not guaranteed by Ginnie Mae, Fannie Mae, or Freddie Mac. Collateralized Mortgage Obligations (CMO) is a multi-class security backed by a pool of mortgage pass-through securities and/or mortgage loans. CMOs were developed to offer investors a wider range of investment terms and level of risk than is available for mortgage pass-through securities. Securitization is a financing method whereby groups of similar assets, such as loans, are pooled together to serve as collateral for the issuance of a new security. The resulting asset-backed security (ABS) can then be sold to, and traded by, investors in the capital markets. equipment loans and leases, and more. Individually, these assets could be difficult and inefficient to sell or trade. Securitizing assets creates a new, more liquid tradeable financial asset, which can be used to provide funding for a wide range of consumer and business credit needs. Securitizations typically rely on the cash flows generated by the underlying financial assets for the repayment of investors, as opposed to the general credit or the claims-paying ability of an operating entity. Cash flows generated by the securitized assets can be structured, or tranched, in a way that can achieve targeted credit, maturity or other characteristics desired by investors, or they may simply be passed through to holders as they come in. Asset-backed securities collateralized by residential mortgage loans are called residential “mortgage-backed securities” (MBS). A residential MBS is a fixed-income security, collateralized by residential mortgage loans that finance the purchase or the refinancing of homes or other real estate. The security is created when these mortgage loans are packaged, or pooled, to serve as collateral and transferred to a trust that will hold the loans. These securities are sold to investors and as the borrowers gradually pay off the underlying mortgage loans, the investors receive payments of interest and principal according to the terms of the securitization documents. Prior to the 1970s, banks were generally portfolio lenders – that is, they held the loans they made until they either matured or were paid off. These loans were financed by bank deposits and occasionally the bank’s own debt obligations, and their volume was also limited by these factors. However, as demand for mortgage credit grew in the post-World War II era, portfolio lending was insufficient to keep pace with this demand, leading to the development of the MBS market. The modern era of mortgage securitization began when the first MBS was issued in 1970, guaranteed by the Government National Mortgage Association (GNMA, or “Ginnie Mae”). 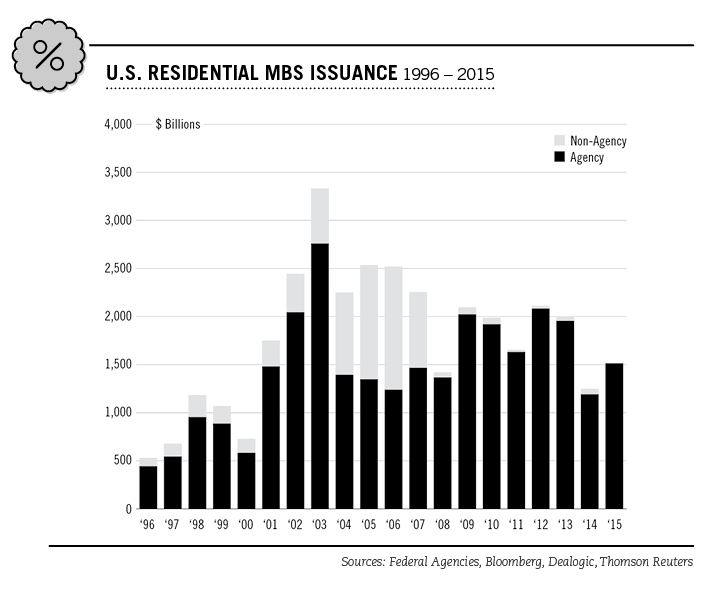 In the United States, the MBS market is crucial to both the availability and affordability of housing. The majority of residential mortgage loans originated today are securitized. The ability to securitize mortgage loans gives lenders access to global sources of capital, making financing available to home buyers at lower costs, and promoting a national market for mortgage loans with broader availability of affordable credit than would be otherwise possible. Characteristics of the mortgage loans that collateralize MBS vary. The borrower typically repays the mortgage loan in monthly installments. Most residential mortgages require regular principal and interest payments for a 10, 15, 20 or 30-year term, with 30-year terms being the most common. Over the life of most mortgage loans, the interest component of a payment gradually declines while the principal component increases. Interest rates on mortgage loans may be fixed, or they may be floating and vary with reference to a specified index or benchmark. Some loans allow borrowers to pay solely the interest for a specified period (“interest only” loans); others may allow borrowers to make payments that are less than the interest due on the loan. Generally, the loans in an MBS are relatively uniform across these high-level characteristics (for example, most loans have the same original term), but will likely have varying interest rates, borrower credit quality, geographic distribution, and other factors. In this pamphlet, we will review the main types of MBS: “pass- through” securities and “collateralized mortgage obligations” (CMOs). An issuer of a pass-through security collects monthly payments from borrowers in a given loan pool and “passes through” the cash flow to investors in monthly payments, less any servicing and guarantee fees. Pass-throughs represent a direct ownership interest in a pool of loans. Most pass-throughs are backed by fixed-rate mortgage loans; however, adjustable-rate mortgage loans (ARMs) are also pooled to create the securities. Most ARMs have both interest rate floors and caps, setting minimum and maximum interest rates on a loan that could impact the cash-flow to an MBS collateralized by ARMs in certain interest rate environments. While the creation of mortgage pass-through securities has greatly increased the secondary market for mortgage loans, the structures of these securities have some limitations and may not be suitable for all investors. For example, mortgage pass-through securities generally appeal to investors with a longer investment horizon. The CMO is a multi-class security backed by a pool of mortgage pass-through securities and/or mortgage loans. CMOs were developed to offer investors a wider range of investment terms and level of risk than is available for mortgage pass-through securities. The different classes of securities in a CMO offering are known as tranches, from the French word for “slice.” The CMO structure enables the issuer to direct the principal and interest cash flow generated by the collateral to the different tranches in a prescribed manner in order to meet different investment objectives. In structuring a CMO, an issuer distributes cash flow from the underlying collateral over a series of classes, or tranches, which constitute the bond issue. Each CMO comprises two or more tranches, each having average lives and cash-flow patterns designed to meet specific investment objectives. For example, the average life expectancies of the different tranches in a CMO might be two, five, seven and 20 years. This structuring is done to create tranches that meet the needs of MBS investors, who may be looking for a particular maturity or other feature for their investment. Cash flows from the CMO collateral may be allocated in a variety of ways. Usually, it is first allocated to meet the interest obligations on all tranches in the offering. Principal repayments, both scheduled and prepaid, are then distributed to the different classes of bondholders according to a predetermined priority schedule, which is outlined in the CMO prospectus or offering circular. The tranche receiving principal repayment is referred to as active or “currently paying.” In more complex structures, more than one tranche may receive principal (or be active) at a given time. Each CMO tranche has an estimated first payment date on which investors can expect to begin receiving principal payments, and an estimated last principal payment (or maturity) date on which they can expect their final dollar of principal to be returned. Both the first and last principal payment dates are estimates based on prepayment assumptions and can vary according to actual prepayments made on the underlying collateral of a CMO. The period between the two dates is known as the window. The period when investors receive interest-only payments before principal payments begin in a given tranche is known as the lockout period. Investors who purchase CMOs at their issue date may find that their transaction takes up to a month to settle due to the time required to assemble the collateral, deposit it with the trustee, and complete other legal and reporting requirements. In the secondary market, CMO transactions typically settle in three business days. Payment dates for CMO tranches are defined in the prospectus and are usually stated as the 15th or 25th day of the month following the record date. Depending on when the CMO transaction settles, the investor may have to wait up to two months for the first payment; this delay is factored into the yield quoted at the time of purchase. After the first payment is received, future payments are made monthly or quarterly. Most CMOs are issued in the form of a Real Estate Mortgage Investment Conduit or REMIC, which is a structure that issues multiclass mortgage-backed securities with certain tax and accounting advantages for issuers and investors due to the Tax Reform Act of 1986. The terms “REMIC” and “CMO” are currently used interchangeably. The most basic CMO structure is made up of tranches that pay in a strict sequence. Each tranche receives regular interest payments, but principal payments received are made to the first tranche alone until it is completely retired. When the first tranche is retired, principal payments are applied to the second tranche until it is fully retired, and the process continues until the last tranche is retired. For example, the first tranche of the offering may have an average life of two to three years, the second tranche five to seven years, the third tranche 10 to 12 years, and so on. This type of CMO is known as a sequential pay, clean or plain vanilla offering. The CMO structure allows the issuer to meet different maturity requirements and to distribute the impact of prepayment variability among tranches. This flexibility has led to increasingly varied and complex CMO structures. CMOs may have multiple tranches, each with unique characteristics that may be interdependent with other tranches in the offering. Planned Amortization Class (PAC) tranches use a mechanism similar to a sinking fund to establish a fixed principal payment schedule that directs cash-flow irregularities caused by faster-or slower-than-expected prepayments away from the PAC tranche and toward another tranche. With a PAC tranche, the yield, average life, and lockout periods estimated at the time of investment should be more likely to remain stable over the life of the security. PAC payment schedules are protected by prioritization that assures that PAC payments are met first out of principal payments from the underlying mortgage loans. Principal payments in excess of the scheduled payments are diverted to non-PAC tranches in the CMO structure called companion or support tranches because they support the PAC schedules. In other words, at least two bond tranches are active at the same time: a PAC and a companion or support tranche. When prepayments are minimal, payments are made first to the PAC tranche while the companion tranche may have to wait to receive payments. When prepayments are heavy, the PAC tranche pays only the scheduled amount, and the companion class absorbs the excess. Type I PAC tranches maintain their schedules over the widest range of actual prepayment speeds, for example from 100% to 300% of the Prepayment Speed Assumptions (PSA). Type II and Type III PAC tranches can be created with lower priority for principal payments from the underlying collateral than the primary or Type I tranches. They function as support tranches to higher-priority PAC tranches and maintain their schedules under increasingly narrower ranges of prepayments. 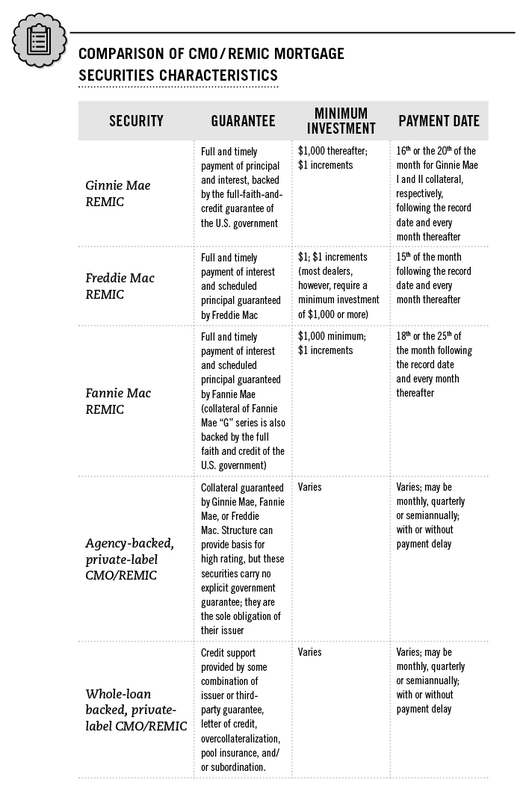 PAC tranches are a common type of CMO tranche. Because they offer a higher degree of cash flow certainty, PAC tranches are usually offered at lower yields. Like PAC tranches, Targeted Amortization Class (TAC) tranches also provide more cash-flow certainty and a fixed principal payment schedule. However, this certainty applies to only one prepayment rate rather than a range. If prepayments are higher or lower than the defined rate, TAC holders may receive more or less principal than the scheduled payment. TAC tranches’ actual performance depends on their priority in the CMO structure and whether or not PAC tranches are also present. If PACs are also present, the TAC tranche will have less cash-flow certainty. If no PACs are present, the TAC provides the investor with some protection against accelerated prepayment speeds and early return of principal. Yields on TAC bonds are typically higher thanyields on PAC tranches, but lower than yields on companion tranches. As mentioned, every CMO that has PAC or TAC tranches will also have companion or support tranches to absorb the prepayment variability that has been removed from the PAC and TAC tranches. After the principal is paid to the active PAC and TAC tranches, according to the schedule, the remaining excess or shortfall is reflected in payments to the active companion tranche. The average life of a companion tranche may vary widely, increasing when interest rates rise and decreasing when rates fall. To compensate for this variability, companion tranches offer the potential for higher expected yields when prepayments remain close to the rate assumed at purchase. Similar to Type II and Type III PACs, TAC tranches can serve as companion tranches for PAC tranches. These lower-priority PAC and TAC tranches will in turn have companion tranches further down in the principal payment priority. Companion tranches are often offered for sale to retail investors who want higher income and are willing to take more risk of having their principal returned sooner or later than expected. Z-tranches, also known as accretion bonds or accrual bonds, are structured so that they pay no interest until the lockout period ends and principal payments begin. Instead, a Z-tranche is credited “accrued interest” and the face amount of the bond is increased at the stated coupon rate on each payment date. During the accrual period, the principal amount outstanding increases at a compounded rate and the investor does not face the risk of reinvesting at lower rates if market yields decline. 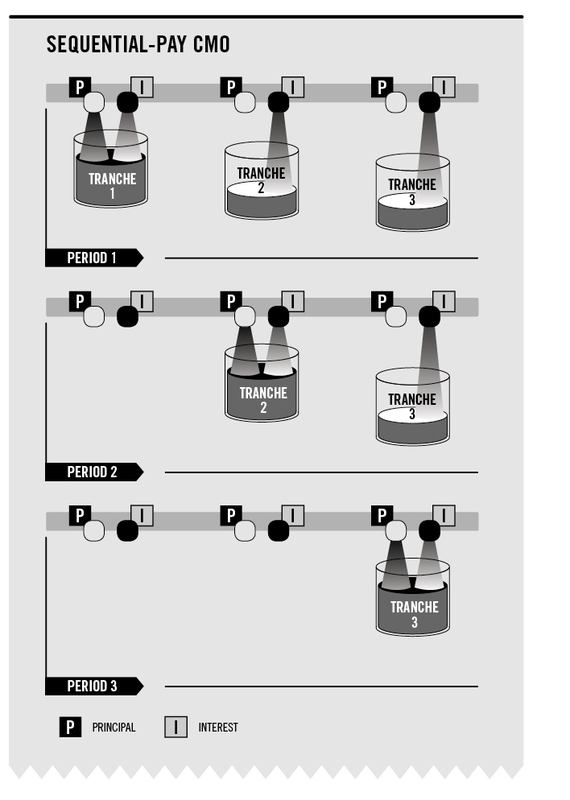 Typical Z-tranches are structured as the last tranche in a series of sequential or PAC and companion tranches, and typically have longer average lives than these classes. However, Z-tranches can be structured with intermediate-term average lives as well. After the earlier bonds in the series have been retired, the Z-tranche holders start receiving cash payments that include both principal and interest. While the presence of a Z-tranche can stabilize the cash flow in other tranches, the market value of Z-tranches can fluctuate widely, and their average lives depend on other aspects of the offering. Because the interest on these securities is taxable when it is credited, even though the investor receives no interest payment, Z-tranches are often suggested as investments for tax-deferred accounts. Some mortgage-backed securities are created so that investors receive only principal payments generated by the underlying collateral; the process of separating the interest payments from the principal payments is called “stripping”. These Principal-Only (PO) securities may be created directly from mortgage pass-through securities, or they may be tranches in a CMO. In purchasing a PO, investors pay a price deeply discounted from the face value and ultimately receive the entire face value through scheduled payments and prepayments. The market values of POs are extremely sensitive to prepayment rates. If prepayments accelerate, the value of the PO will increase. On the other hand, if prepayments decelerate, the value of the PO will drop. A companion tranche structured as a PO is called a Super PO. When creating a PO mortgage security, the resulting stripped interest payments necessitate the creation of Interest-Only (IO) securities. IO securities are sold at a deep discount to their notional principal amount, namely the principal balance used to calculate the amount of interest due. They have no face or par value. As the notional principal amortizes and prepays, the IO cash flow declines. Unlike POs, IOs increase in value when interest rates rise and prepayment rates slow; consequently, they are often used to hedge portfolios against interest rate risk. However, IO investors take on the risk that if prepayment rates are high enough, they may actually receive less cash back than they initially invested. IOs and POs are more sensitive to changes in prepayment speeds and that heightened risk may make them unsuitable for some investors. First offered in 1986, floating-rate CMO tranches carry interest rates that are tied in a fixed relationship to an interest rate index, such as the London Interbank Offered Rate (LIBOR), the Constant Maturity Treasury (CMT), or the Cost of Funds Index (COFI). These tranches are subject to an upper limit rate cap and sometimes a lower limit floor. The performance of these investments depends largely on the way interest rate movements affect prepayment rates and average lives. Sometimes the interest rates on these tranches are stated in terms of a formula based on the designated index, meaning they move up or down by more than one basis point for each increase or decrease in the index. These so-called super-floaters offer leveraged returns when rates rise, while inverse floaters (which move in a direction opposite to the changes in the designated index) offer leveraged returns when rates move down. Given their leveraged nature, these securities also carry increased risk. All types of floating-rate tranches may be structured as PAC, TAC, companion, or sequential tranches, and are often used to hedge interest rate risks in portfolios. CMOs also contain a residual interest tranche, which collects any cash flow remaining from the collateral after the obligations to all the other tranches have been met. Residuals are not classified as regular interest and may be structured as sequential, PAC, floating- rate, or inverse-floater tranches, and differ from regular tranches primarily in their tax characteristics, which can be more complex than other CMO tranches. CMOs issued as non-REMICs also have residuals that are sold as a separate security, such as a trust certificate or a partnership interest. Callable pass-throughs can be used as collateral to back CMOs. Investors should be aware that a call of some or all of the underlying callable pass-throughs may result in a call of all of the outstanding tranches in the CMO they invested in because some or all of the securities underlying the CMO will be redeemed. Securities guaranteed by these entities are known generically as “agency mortgage-backed securities.” Note that each agency is a separate entity, and the securities issued by Fannie Mae or Freddie Mac differ from each other and those guaranteed by Ginnie Mae. 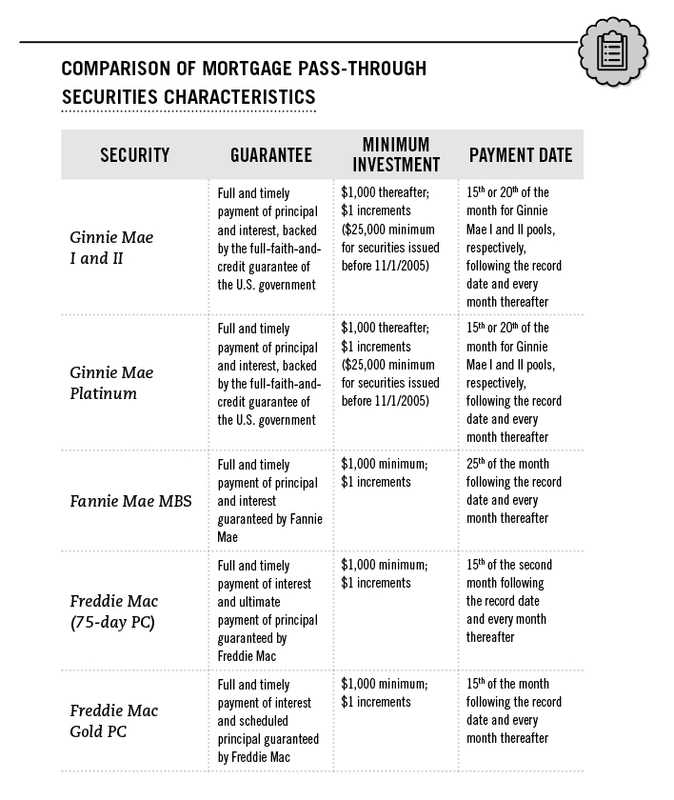 Fannie Mae and Freddie Mac issue and guarantee pass-through securities and CMOs. Ginnie Mae adds its guarantee to already- issued pass-through securities and CMOs that meet its standards. Mortgage lenders must apply to Ginnie Mae for approval to issue securities under its programs and for its commitment to guaranty a specific amount of securities. An approved issuer originates or acquires mortgages that are either insured or guaranteed by the Federal Housing Administration (FHA), the Department of Veterans Affairs (VA), the Department of Agriculture’s Rural Development (RD), or the Department of Housing and Urban Development’s Office of Public and Indian Housing (PIH). Loans underlying Fannie Mae and Freddie Mac securities must meet underwriting criteria prescribed by the GSEs (for example, loan size, documentation, loan-to-value ratios, and so on). Qualifying mortgages are assembled into pools according to specific pooling criteria set by Ginnie Mae. Upon approval, Ginnie Mae authorizes its transfer agent to create and deliver Ginnie Mae-guaranteed securities. The issuer remains responsible for administering the securities and servicing the mortgage pools. The nature of the security guarantee depends on the agency. Ginnie Mae, for example, guarantees the timely payment of principal and interest on its mortgage-backed securities, and its guarantee is backed by the “full faith and credit” of the U.S. government. Holders of Ginnie Mae mortgage-backed securities are therefore assured of receiving payments promptly each month, regardless of whether the underlying homeowners make their payments. Fannie Mae and Freddie Mac generally guarantee timely payment of both principal and interest on their mortgage-backed securities whether or not the payments have been collected from the borrowers. However, unlike Ginnie Mae, neither Fannie Mae nor Freddie Mac securities carry the additional “full faith and credit”U.S. government guarantee. Some private institutions – such as subsidiaries of investment banks, financial institutions, and real estate investment trusts – issue MBS not guaranteed by Ginnie Mae, Fannie Mae, or Freddie Mac. These are referred generically to as private label MBS or non-agency MBS. Their underlying collateral will typically consist of mortgage loans or mortgage loan pools that do not qualify for agency mortgage-backed securities due to loan size, credit factors, or for other reasons. The mortgage-backed security issuer typically segregates the collateral or deposits it in the care of a designated trustee, a party who holds and manages the collateral for the exclusive benefit of the mortgage-backed security bondholders. Private label mortgage-backed securities are often assigned ratings by credit rating agencies based on their structure, issuer, collateral, documentation, any guarantees, and other factors. The transactions may use alternative credit enhancements such as letters of credit or features designed to provide greater repayment assurance to more senior tranches, and may involve complexly structured payment priorities. It is important to note that a private label MBS is the sole obligation of their issuer and is not guaranteed by any of the GSEs or the U.S. government. With fixed-income securities like corporate or Treasury bonds, the purchase of a bond from an issuer is essentially a loan to the issuer in the amount of the principal, or face value, for a prescribed time period. In return for this loan, the bondholder receives interest, generally in semiannual payments, until the bond is redeemed. When the bond matures (or is called by the issuer), the issuer returns the face value to the investor in a single principal payment. Although MBS typically entitle investors to payments of principal and interest, they differ from corporate and Treasury securities in important ways. For a mortgage-backed security, the ultimate borrower is a homeowner who takes on a mortgage loan. Because the homeowner’s monthly payments include both interest and principal, the mortgage security investor’s principal is returned over the life of the security, or amortized, rather than repaid in a single lump sum at maturity. As the principal is repaid, or prepaid, the interest portion of the payment gradually shrinks, because it is based on a lower amount of outstanding principal. In addition, while most bonds pay interest semiannually, mortgage-backed securities may pay interest and principal monthly, quarterly or semiannually, depending on the structure and terms of the issue. Because principal is reduced over the life of the security, interest income tends to decrease over time in terms of absolute dollars paid to investors. A mortgage-backed security matures when the investor receives the final principal payment. Both mortgage pass-through securities and CMO tranches have a stated maturity based on the last date on which the principal from the collateral is scheduled to be paid in full. This date is theoretical because it assumes no prepayments on the underlying mortgage loans. Most mortgage pass-through securities are collateralized by fixed-rate mortgage loans with an original maturity of 30 years, but many loans will be paid off earlier – this is called prepayment of the loan. The cash flow on mortgage-backed securities may be somewhat irregular since the timing and speed of principal repayments by mortgage borrowers can vary. Typically, a mortgage borrower can prepay the mortgage loan at any time by selling the property, refinancing the mortgage, or simply paying off the loan in part or in full. Investors also will receive prepayments in some MBS when borrowers default on their loans.5 When this happens, the investor’s remaining interest in the pool is reduced by the prepayment amount. In the case of CMOs, investors receive these principal repayments according to the payment priorities of the class of securities they own. Prepayment assumptions are estimates of expected prepayments. Industry standard and various proprietary prepayment rate models exist and are used by investors to value investments in MBS. Their assumptions may be based on past prepayment rates for each particular type of mortgage loan, various economic conditions and geographical locations of the specific properties, among other factors. These assumptions are factored into the offering price, yield, and market value of a mortgage security. The realization of the average life and yield estimates depends on the accuracy of the prepayment assumptions. A common way of expressing prepayment rates is based on the Standard Prepayment Model developed by the Securities Industry and Financial Markets Association (SIFMA) and located online at www.sifma.org/tba under “Standard Formulas for the Analysis of Mortgage-Backed Securities and Other Related Securities.” SIFMA’s model assumes that new mortgage loans are less likely to be prepaid than older, “seasoned” mortgage loans. Projected and historical prepayment rates are often expressed as percentage of PSA. Other common measures of prepayment speeds include the Conditional Prepayment Rate (CPR) and “single monthly mortality” (SMM). Average life is the average time that each dollar of principal in the pool is expected to be outstanding, based on certain prepayment assumptions. Because of the ability of borrowers to prepay the underlying mortgage loans, MBS are often discussed in terms of their average life rather than their stated maturity date. If prepayment speeds are faster than expected, the average life of the mortgage security will be shorter than the original estimate; if prepayment speeds are slower, the mortgage security’s average life will be extended. In the case of CMOs, some tranches are specifically designed to minimize the effects of a variable prepayment rate. As is the case of all mortgage-backed securities, the average life of the security is always an estimate at best, depending on how closely the actual prepayment speeds of the underlying mortgage loans match assumptions. Movements in market interest rates may have a greater effect on mortgage-backed securities than on other fixed-interest obligations because interest rate movements also affect the underlying mortgage loan prepayment rates: as yields fall, homeowners are more likely to refinance or repay their loan more quickly, resulting in higher prepayment speeds and a shorter average life, while the reverse is true when yields rise. Consequently, a mortgage-backed security’s average life and yield may change as interest rates change. If interest rates fall and prepayment speeds accelerate, mortgage- backed security investors may receive their principal back sooner than expected and have to reinvest it at lower interest rates (call risk). If interest rates rise and prepayment speeds slow, investors may find their principal committed for a longer period of time, causing them to miss the opportunity to earn a higher rate of interest (extension risk). Therefore, investors should carefully consider the effect that interest rate changes may have on the performance of their mortgage- backed security investment. Mortgage-backed securities are often priced at a higher yield than Treasury and corporate bonds of comparable maturity, reflecting compensation for the uncertainty of their average lives as well as their potentially higher credit risk. However, they typically have yields lower than the interest rates paid on the underlying mortgage loans because a portion of the interest paid by the mortgage borrower is retained by the loan servicer as a servicing fee for collecting payments from borrowers and distributing the monthly payments to investors. Furthermore, in the case of agency securities, Ginnie Mae, Fannie Mae and Freddie Mac collect compensation for their guarantees (“guarantee fees”). As with any bond, the yield on a mortgage-backed security depends on the purchase price in relation to the interest rate and the length of time the investor’s principal remains outstanding. Mortgage- backed security yields are often quoted relative to yields on Treasury securities with maturities closest to the mortgage-backed security’s estimated average life. The estimated yield on a mortgage-backed security reflects its estimated average life based on the assumed prepayment rates for the underlying mortgage loans. For securities purchased at a discount to face value, faster prepayment rates will tend to increase the yield-to-maturity, while slower prepayment rates will tend to reduce it. For securities purchased at a premium, faster prepayment rates will tend to reduce the yield-to-maturity, while slower rates will tend to increase it. For securities purchased at par, these effects should be lessened. Because mortgage-backed securities pay monthly or quarterly, rather than on a semiannual schedule, mortgage security investors may receive their interest income more frequently than investors in other types of bonds. Therefore, mortgage-backed securities are often discussed in terms of their bond equivalent yield, which is the actual mortgage security yield adjusted to account for its greater present value resulting from more frequent interest payments. The minimum investment for a mortgage-backed security varies according to the structure of the offering, but most securities sold to individual investors require a minimum investment of $1,000. Securities dealers make markets in mortgage-backed securities. These transactions are executed Over-The-Counter (OTC), counterparty to counterparty, instead of through an exchange. Mortgage-backed securities dealers trade the securities at a cost that includes compensation for the dealer’s involvement in the transaction. A dealer will typically try to sell a bond for a higher price than the price at which it was acquired. This is called the bid-ask spread, and bid-ask spreads on mortgage-backed security transactions may be wider than spreads on Treasury security transactions because Treasury securities have a broader and deeper secondary market and are therefore more liquid. Although there is a secondary market for many types of mortgage- backed securities, the degree of liquidity depends upon the characteristics of the individual security and can vary widely with economic and market conditions. If a mortgage-backed security is sold in the secondary market rather than held until the final principal payment, the security may be worth more or less than its original face value, and may be worth more or less than the price at which it was purchased. This list is not exhaustive, but should give you an idea of the kinds of questions that should be answered. Your own investment priorities, risk tolerance and other individual factors should be taken into account before making any investment. Contact your financial professional to discuss whether investing in MBS or CMO is for you. The interest portion of payments to mortgage securities investors is subject to federal, state, and local income tax. When comparing Treasury yields to mortgage security yields, one should keep in mind that interest income from Treasury securities is exempt from state and local income tax. Consult your tax and/or financial advisor for more information on specific tax considerations. Accretion bond. Also Accrual bond. See Z-tranche. Active tranche. A CMO tranche that is currently paying principal payments to investors. Amortization. Liquidation of a debt through installment payments. Basis point. One one-hundredth (.01) of a percentage point. Yield differences are often quoted in basis points (bps). Beneficial owner. One who benefits from owning a security, even if the security’s title of ownership is in the name of a broker or bank. Bond equivalent yield. An adjustment to a CMO yield that reflects its Greater present value, created because CMOs pay monthly or quarterly interest unlike most types of bonds, which pay interest semiannually. Call risk. For a CMO, the risk that declining interest rates may accelerate mortgage loan prepayment speeds, causing an investor’s principal to be returned sooner than expected. As a consequence, investors may have to reinvest their principal at a lower rate of interest. CMO (Collateralized Mortgage Obligation). A multiclass bond backed by a pool of mortgage pass-through securities or mortgage loans. See REMIC. CMT (Constant Maturity Treasury). A series of indexes of various maturities (one, three, five, seven, or 10 years) published by the Federal Reserve Board and based on the average yield of a range of Treasury securities adjusted to a constant maturity corresponding to that of the index. COFI (Cost of Funds Index). A bank index reflecting the weighted average interest rate paid by savings institutions on their sources of funds. There are national and regional COFI indexes. Collateral. Securities or property pledged by a borrower to secure payment of a loan. If the borrower fails to repay the loan, the lender may take ownership of the collateral. Collateral for CMOs consists primarily of mortgage pass-through securities or mortgage loans, but may also encompass letters of credit, insurance policies, or other credit enhancements. Companion tranche. A CMO tranche that absorbs a higher level of the impact of collateral prepayment variability in order to stabilize the principal payment schedule for a PAC or TAC tranche in the same offering. Confirmation. A document used by securities dealers and banks to state, in writing, the terms and execution of a verbal arrangement to buy or sell a security. Conventional mortgage loan. A mortgage loan that is based solely on real estate as security, is not insured or guaranteed by a government agency, and is eligible for purchase or insurance by Fannie Mae or Freddie Mac. CPR (Constant Prepayment Rate). Also known as conditional prepayment rate. The percentage of outstanding mortgage loan principal that prepays in one year, based on an annualized Single Monthly Mortality (SMM), which reflects the outstanding mortgage loan principal that prepays in one month. Current face. The current remaining principal on a mortgage security. Current face is computed by multiplying the original face value of the security by the current principal balance factor. CUSIP. CUSIP numbers are unique nine-character alphanumeric identifiers assigned to each series of securities. The Committee on Uniform Security Identification Procedures was established by the American Bankers Association to develop a uniform method of identifying securities. Extension risk. For a CMO, the risk that rising interest rates may slow the anticipated prepayment speeds, causing investors to find their principal committed longer than they expected. As a consequence, they may miss the opportunity to earn a higher rate of interest on their money. Face. The principal amount of a security that appears on the face of the instrument. With mortgage-backed securities, the amount of debt outstanding on the underlying mortgage loans. Factor. A decimal value reflecting the proportion of the outstanding principal balance of a mortgage security, which changes over time, in relation to its original principal value. Floating-rate CMO. A CMO tranche that pays an adjustable rate of interest tied to a representative interest rate index such as the London Interbank Offered Rate (LIBOR), the Constant Maturity Treasury (CMT), or the Cost of Funds Index (COFI). Hedge. A commitment or investment made with the intention of minimizing the impact of adverse price movements in an asset or liability, offsetting potential losses. Inverse floater. A CMO tranche that pays an adjustable rate of interest that moves in the opposite direction from movements in a representative interest rate index such as the London Interbank Offered Rate (LIBOR), the Constant Maturity Treasury (CMT), or the Cost of Funds Index (COFI). IO (interest-only) security. A security or tranche that pays only interest and not principal. IO securities are priced at a deep discount to the “notional” amount of principal used to calculate the amount of interest due. Issue date. The date on which a security is deemed to be issued and begins to accrue interest. Jump Z-tranche. A Z-tranche that may start receiving principal payments before prior tranches are retired if market forces create a “triggering” event, such as a drop in Treasury yields to a defined level, or a prepayment experience that differs from assumptions by a specific margin. “Sticky” jump Z-tranches maintain their changed payment priority until they are retired. “Non-sticky” jump Z-tranches maintain their priority only temporarily for as long as the triggering event is present. Although jump Z-tranches are no longer issued, some still trade in the secondary market. LIBOR (London Interbank Offered Rate). A benchmark rate that provides an indication of the rate at which banks may obtain unsecured funding in the London interbank market. Lockout. The period of time before a CMO investor will begin receiving principal payments. Mortgage. A legal instrument that creates a lien upon real estate securing the payment of a specific debt. Mortgage loan. A loan secured by a mortgage. Mortgage pass-through security. A type of mortgage-backed security representing a direct interest in a pool of mortgage loans. The pass-through issuer or servicer collects the payments on the loans in the pool and “passes through” the principal and interest to the security holders on a pro rata basis. Offer. The price at which a seller is willing to sell a security. Original face. The face value or original principal amount of a security on its issue date. PAC (planned amortization class) tranche. A CMO tranche that uses a mechanism similar to a sinking fund to determine a fixed principal payment schedule that will apply over a range of prepayment assumptions. The effect of the prepayment variability that is removed from a PAC bond is transferred to a companion tranche. Par. Price equal to the face amount of a security; 100%. Payment date. The date that principal and interest payments are paid to the record owner of a security. P&I (principal and interest). The term used to refer to regularly scheduled payments or prepayments of principal and of interest on mortgage securities. Plain-vanilla CMO. See Sequential-pay CMO. PO (principal-only) security. A tranche or security that pays investors principal only and not interest. PO securities are priced at a deep discount from their face value. pass-through securities, pools are identified by a number assigned by the issuing agency. Prepayment. The unscheduled partial or complete payment of the principal amount outstanding on a loan, such as a mortgage, before it is due. PSA (Prepayment Speed Assumptions). A model that estimates the prepayment rate of loans that collateralize an MBS. Price. The dollar amount to be paid for a security, which may also be stated as a percentage of its face value or par in the case of debt securities. Bond prices are reﬂected in their yields, which vary inversely with the dollar price. Principal. The face amount of a bond, payable at maturity. With mortgage-backed securities, the amount of debt outstanding on the underlying mortgage loans. Private label. The term used to describe a mortgage security whose issuer is an entity other than a U.S. government agency or U.S. government-sponsored enterprise. Such issuers may be banks, subsidiaries of investment banks, other financial institutions, or home builders, for example. Pro rata. Proportional distribution to all holders of the same class, based on ownership. Ratings. Or Credit ratings. Designations used by credit rating agencies to give relative indications as to opinions of credit quality. Record date. The date for determining the owner entitled to the next scheduled payment of principal or interest on a mortgage security. REMIC (Real Estate Mortgage Investment Conduit). A pass-through investment vehicle, which issues multiclass mortgage-backed securities that have certain tax and accounting advantages for issuers and investors due to the Tax Reform Act of 1986. Currently, most CMOs are issued in REMIC form and the terms “REMIC” and “CMO” are now used interchangeably. Residual. In a CMO, the residual is that tranche, which collects any cash flow from the collateral that remains after obligations to the other tranches have been met. Sequential-pay CMO. The most basic type of CMO. All tranches receive regular interest payments, but principal payments are directed initially only to the first tranche until it is completely retired. Once the first tranche is retired, the principal payments are applied to the second tranche until it is fully retired, and so on. Also known as a ‘plain vanilla’ or ‘clean’ CMO. Servicing. The process of collecting and remitting payments and recoveries on mortgage loans that make up a mortgage pool; accounting; bookkeeping; insurance; tax records; and default management. Servicing fee. The amount retained by the mortgage servicer from monthly interest payments made on a mortgage loan. Settlement date. The date on which the transfer of cash and securities agreed to in a transaction is completed. SMM (Single Monthly Mortality). The percentage of outstanding mortgage loan principal that prepays in one month. Standard Prepayment Model. (SIFMA prepayment model). A model based on historical mortgage prepayment rates used to estimate prepayment rates on mortgage-backed securities. SIFMA’s model is based on the Constant Prepayment Rate (CPR), which annualizes the Single Monthly Mortality (SMM), or the amount of outstanding principal that is prepaid in a month. Projected and historical prepayment rates are often expressed as “percentage of PSA” (Prepayment Speed Assumptions). A prepayment rate of 100% PSA implies annualized prepayment rates of 0.2% CPR in the first month, 0.4% CPR in the second month, 0.6% CPR in the third month, and 0.2% increases in every month thereafter until the thirtieth month, when the rate reaches 6%. From the thirtieth month until the mortgage loan reaches maturity, 100% PSA equals 6% CPR. Super PO. A principal-only security structured as a companion bond. Superfloater. A floating-rate CMO tranche whose rate is based on a formulaic relationship to a representative interest rate index. Support tranche. See Companion tranche. TAC tranche. Targeted amortization class tranche. A TAC tranche uses a mechanism similar to a sinking fund to determine a fixed principal payment schedule based on an assumed prepayment rate. The effect of prepayment variability that is removed from the TAC tranche is transferred to a companion tranche. Tranche. The French word for “slice”, tranche usually refers to part, segment or portion of an investment issue such as a specific class of bond or mortgage backed security within an offering in which each tranche offers different terms including varying degrees of risk. Tranche may also refer to the segment of the bond offering being distributed in different geographical areas. Trustee. An entity designated by the issuer as the custodian of funds and official representative of bondholders. Trustees are appointed to ensure compliance with the pooling and servicing agreement or trust indenture and represent bondholders to enforce their contract with the issuers. Weighted average coupon (WAC). The weighted average interest rate of the underlying mortgage loans or pools that serve as collateral for a security, weighted by the size of the principal loan balances. Weighted average loan age (WALA). The weighted average number of months since the date of the origination of the mortgages (i.e., the age of the loans) that collateralize a security, weighted by the size of the principal loan balances. Weighted average maturity (WAM). The weighted average number of months to the final payment of each loan backing a mortgage security weighted by the size of the principal loan balances. Also known as weighted average remaining maturity (WARM) and weighted average remaining term (WART). Window. In a CMO security, the period of time between the expected first payment of principal and the expected last payment of principal. Yield. The annual percentage rate of return earned on a bond calculated by dividing the coupon interest by its purchase price. Z-tranche. Often the last tranche in a CMO, the Z-tranche receives no cash payments for an extended period of time until the previous tranches are retired. While the other tranches are outstanding, the Z-tranche receives credit for periodic interest payments that increase its face value but are not paid out. When the other tranches are retired, the Z-tranche begins to receive cash payments that include both principal and continuing interest.